Jamaican Jerk Chicken is undoubtedly the most famous of all Jamaican food. It is a well deserved honour - so delicious, so mouth-watering, so more-ish (food that's so good you want more)! 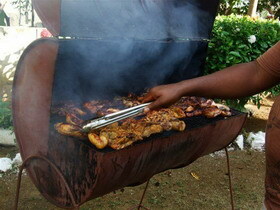 The term JERK refers to cooking highly seasoned meat on a grill or barbeque. The Maroons were the original "jerkers", as they cooked wild pigs on raised wooden racks placed above hot coals. Nowadays, most jerking is done in recycled metal drums which have been cut in half, hence the other popular name - pan chicken. In a large bowl, combine the dry ingredients. With a wire whisk, slowly add the vegetable oil, soy sauce, vinegar, orange juice, and lime juice. Add the Scotch Bonnet pepper and onions. Add the chicken, cover and marinate for at least 4 hours, overnight is better. Remove the chicken from the marinade and barbeque till fully cooked. Baste with the marinade while cooking. The left over marinade can be boiled and used as a dipping sauce. If no barbeque is available, chicken can be baked in a 350 degree oven for 1 hour, basting and turning twice. The use of pimento leaves gives a nice smoky flavour to the chicken. Leaves should be soaked in water for 30 minutes and placed on top of the meat during cooking.